I have misplaced the newspaper clipping announcing their 50th anniversary. Here they are in the early 50’s. My grandpa in this picture is younger than I am now. That’s my mom in my grandma’s arms. Manhood was thrust on my grandfather at an early age and he wore it well. Look at him. I don’ t measure up. I miss my grandparents. I think everybody arrived earlier and earlier each year – in part for the fellowship, in part because there was some competition between an aunt and an uncle for favorite tender morsels. There was always mistletoe hanging in the house and Grandma loved to kiss us. The whole family would set up tables and squeeze into the back room for Christmas dinner. Dad would carve the meat, the buffet would be set out. Basically the same food every year. I got a slice or two of ham, at least two crescent rolls my aunt made, some frozen fruit salad my grandma always made and a slice of the squash pie my great aunt Marion still makes with a dob of cool whip. I sat at the “kids table” in the SE corner of the room. Each year several of us conspired to unroll the youngest cousin’s crescent roll at dinner. Then we would race to pick our favorite spot in the living room and wait to open presents. A favorite cousin and I would sit by the fake fireplace, waiting with increasing impatience while somebody cleaned tables, washed dishes and otherwise added to our frustration. Grandma and Grandpa would take their places in their recliners. The rest of the family would squeeze into the living room. Somebody would pass out presents and…well, manners were forgotten. Paper went flying. One older cousin would gather the paper as it flew his direction and stuff it behind the green couch. I mean, what else are we going to do with it? Every year was the same. Pajamas, bathrobe and socks. This must be around 1994 or 1995. My sister made me that Animaniacs/Marvin the Martian blanket I’m holding. My kids still use it. 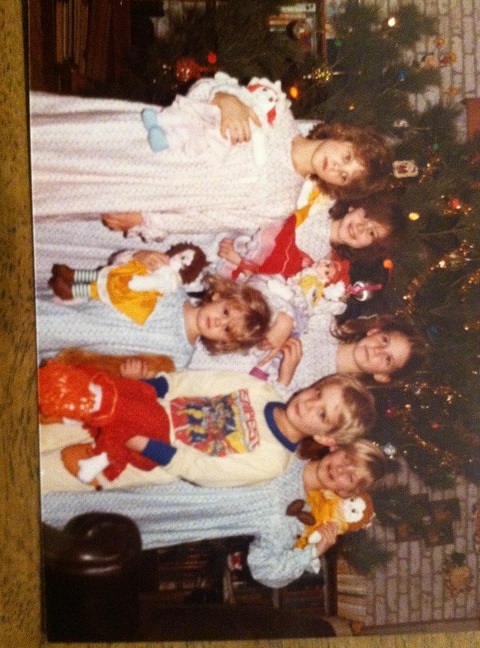 Then all the grandkids would put on their jammies and stand in front of the Christmas tree for pictures. 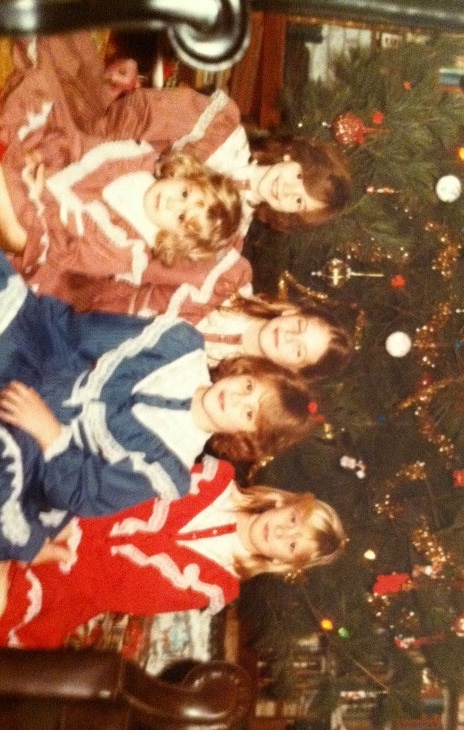 If not jammies, the girls got Christmas dresses. Maybe we would pose in the back room. Whatever the case, family pictures were a must. After that it’s all a blur. Toys, Grandma’s oatmeal chocolate chip cookies, hugs all around. Aunts and uncles and cousins leaving if the weather allowed. We usually stayed the night at grandma’s. Sister would sleep on the green couch, I would sleep on the vinyl couch with several blankets topped by a thin red quilt (Wow. I haven’t thought about that quilt in 20 years). The clock on the mantle would tick away the minutes until I fell asleep. I woke up when grandma would wind the clock in the morning. I must have been unhappy that grandma made me a clown doll. Or just tired. Who knows. That was basically every Christmas of my life. There were small changes over time. 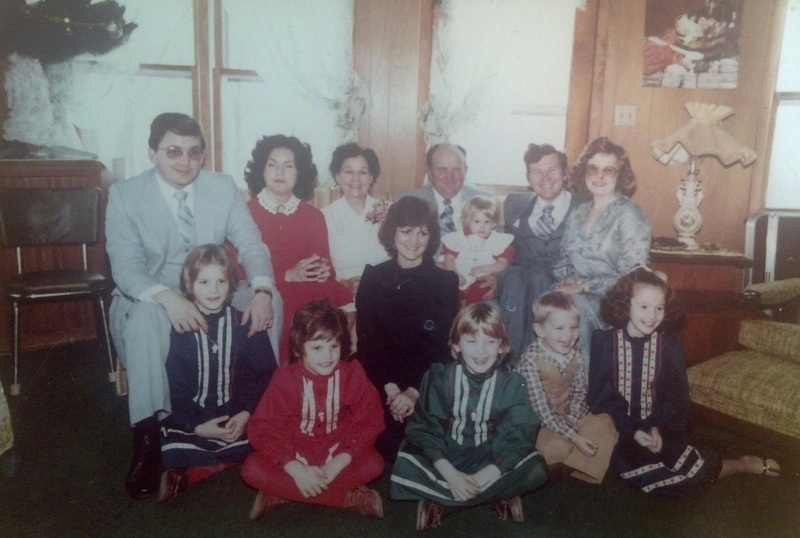 Cousins started bringing friends, then dates…later spouses…then great-grandchildren in numbers beyond counting. I was no longer allowed to sit at the kids table. Somehow the house still fit us all. Somehow grandma made enough cookies. Somehow the septic tank couldn’t manage. The unwritten rule of Christmas is that you go to your grandmother’s house. Now my mother is grandma. My aunt is grandma. The next generation of first cousins play together at their respective grandma’s. I can only hope somebody brings crescent rolls. Julie makes my grandma’s cookies and has found a way to make them even better by adding peppermint oil. Out. Of. This. World! 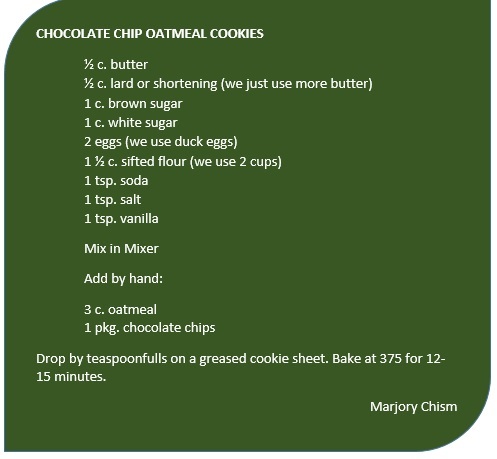 Grandma wrote this recipe but she didn’t use a recipe. I have added notes for the way we bake these so they turn out more like hers. These were always in her freezer in quart bags. Get yourself a glass of milk and a whole bag of cookies and find a quiet place. Julie adds a few drops of (Vendor name censored by the FDA) peppermint oil as a final step. The house has changed though. It’s not my grandma’s house anymore. I’m sorry to say it has lost some of that…that…feeling. Grandma’s furnishings and decorations are properly disbursed among the family. Her paintings, her painted saw blades, the buffet in the dining room, the mantle clock . It’s still grandma’s house but with my stuff in it. It’s not the same somehow…like our stuff doesn’t fit the house because it’s not grandma’s. We’ll figure it out. And like my grandparents we have four children. I look forward to seeing my grandchildren unrolling each other’s crescent rolls and hiding wrapping paper behind the couch and posing for pictures in their new jammies. So many things have changed. So many people are gone now. But my grandparents gave us a family culture, a set of our own traditions and love. My mom is helping deliver Christmas dresses to the great-granddaughters today. I don’t know if this sounds corny or if it sounds boring. I hope it sounds consistent. Consistency is what I got from my grandparents. Every time I saw them. Every visit to their house. Always the same. Always loved. No matter what. This entry was posted in Children on the Farm, Seasonality. Bookmark the permalink. I love the picture of the frosty morning. The recipe needs a teaspoon of baking powder added to it. Sorry about the crescent rolls, I didn’t think of them this year. The Christmas I remember best was before you were born. 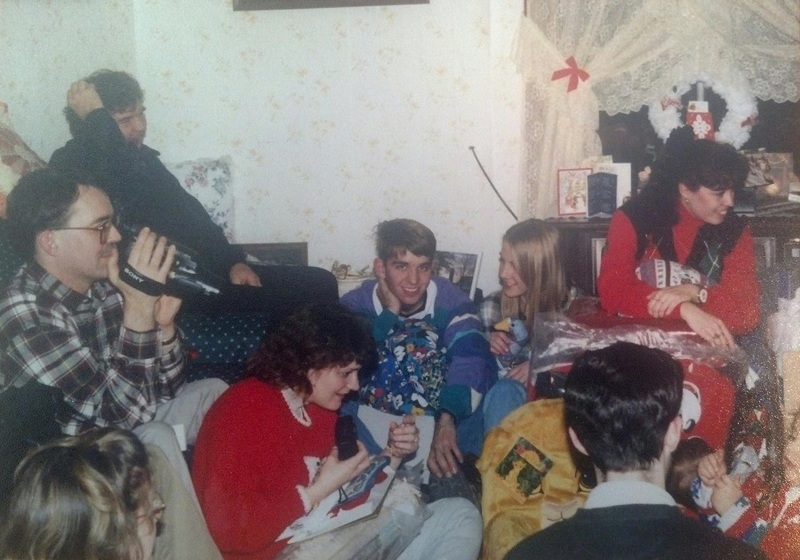 It was our first Christmas after your Dad and Uncle got out of the military. We had really missed all of us being together and your Aunt had made life size Raggedy Annes for the little girls. We had a really great time. I think that is the year many of the family traditions were born. Thanks for putting together a really nice remembrance. I think the last group shot was at their 35th anniversary party, which may have been close to Christmas of 1981, or may not. Christy set it up. I know it’s not a Christmas party shot, because I’m wearing a suit. 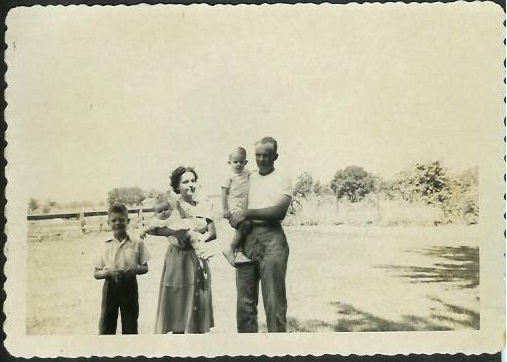 I wish I could get a high-res scan of the 1950 family shot–I don’t have that one. Thanks for sharing the memories. Thanks Uncle Jack. I really wanted a pic of us in our pajamas but couldn’t come up with one at the time so I just used that picture. I found some jammie pics tonight though. I may post them as an update. Mom has the original of the family shot. She may be able to get it to you. Jack we need to get together at my house and you can go through my pix. Your post today brought tears to my eyes. But they are happy tears and also hopeful tears…. For us all to get back to “family” and “home”. Happy Christmas and blessing for the coming year to you and your family. Thanks for sharing your journey. Thank you Shannon. We wish the same to you and yours.